REDOUTE'S CHOICE (AUS) (Bay 1996-Stud 2000). 5 wins-2 at 2, MVRC Manikato S., Gr.1. Champion Aust. Sire 3 times Sire of 1178 rnrs, 899 wnrs, 142 SW, inc. Miss Finland (STC Golden Slipper S., Gr.1), Redoute's Dancer, Stratum, Lankan Rupee, Samantha Miss, Majmu, Fashions Afield, Musir, Nadeem, God's Own, Lotteria, Melito, Wylie Hall, Gallica, King's Rose, Snitzel, Bonaria, Anamato, Howard be Thy Name, Peeping, Royal Descent, Hampton Court, etc. Grunderzeit (Street Cry). 5 wins to 1250m, A$275,550, to 2016-17, ATC TAB Rewards H., Hyland Race Colours H., Cal Rei H., Schweppes Evening Star H., Ranvet H., 2d ATC Bledisloe Cup Festival H., 3d ATC Canterbury Classic, L, Tab.com.au H., Glenn Wheeler H., Ron Finemore Transport H.
Redoutable Heart (Redoute's Choice). 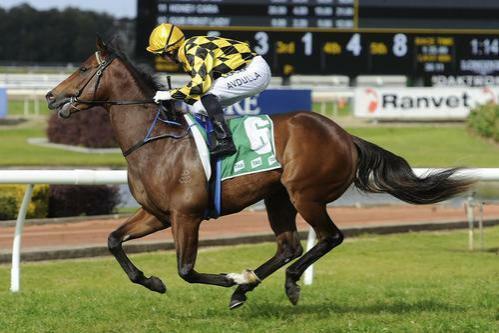 2 wins at 1300m, 1500m, A$201,320, to 2016-17, ATC Australian Wagering Council 4tracks4kids P., TAB H., 2d BRC Grand Prix S., Gr.3, ATC TAB Place Multi H., TAB Rewards H., Inglis Premier Yearling Sale H., Cellarbrations H., 3d ATC Ainsworth Game Technology H., TAB Quaddie H., Membership on Sale H., Power Access H., Hyland Race Colours H.
Winner at 1100m, A$109,675, in 2015-16, ATC TAB Place Multi H., 2d ATC San Domenico S., Gr.3, Bob Ingham 2YO H., Merman & Sydeston H., 4th WATC Miss Andretti S., L.